Determining orthonormal eigenvectors of the DFT matrix, which is closer to the samples of Hermite-Gaussian functions, is crucial in the definition of the discrete fractional Fourier transform. In this work, we disclose eigenvectors of the DFT matrix inspired by the ideas behind bilinear transform. The bilinear transform maps the analog space to the discrete sample space. As j in the analog s-domain is mapped to the unit circle one-to-one without aliasing in the discrete z-domain, it is appropriate to use it in the discretization of the eigenfunctions of the Fourier transform. We obtain Hermite-Gaussian-like eigenvectors of the DFT matrix. For this purpose we propose three different methods and analyze their stability conditions. These methods include better conditioned commuting matrices and higher order methods. We confirm the results with extensive simulations. Discretization of the fractional Fourier transform (FrFT) is vital in many application areas including signal and image processing, filtering, sampling, and time-frequency analysis [1–3]. As FrFT is related to the Wigner distribution , it is a powerful tool for time-frequency analysis, for example, chirp rate estimation . There have been numerous discrete fractional Fourier transform (DFrFT) definitions [5–11]. Santhanam and McClellan  define a DFrFT simply as a linear combination of powers of the DFT matrix. However, this definition is not satisfactory, since it does do not mimic the properties of the continuous FrFT. Candan et al. use the matrix, which has been introduced earlier by Dickinson and Steiglitz  to find the eigenvectors of the DFT matrix in order to generate a DFrFT matrix. The matrix commutes with the DFT matrix, which ensures that both of these matrices share at least one eigenvector set in common. This approach is based on the second-order Hermite-Gaussian generating differential equation. Candan et al. simply replace the derivative operator with the second-order discrete Taylor approximation to second derivative and the Fourier operator with the DFT matrix. Pei et al. define a commuting matrix inspired by the work of Grünbaum , whose eigenvectors approximate the samples of continuous Hermite-Gaussian functions better than the eigenvectors of . Furthermore, the authors use linear combinations of and matrices as to furnish the basis of eigenvectors for the DFrFT matrix. Candan introduces  matrices whose eigenvectors are higher-order approximations to the Hermite-Gaussian functions. The idea is to employ higher-order Taylor series approximations to the derivative operator, which replaces the second derivative operator in the Hermite-Gaussian generating differential equation. However, the order of approximation k is limited by the dimension of the matrix . Pei et al. recently removed the upper bound of this approximation and obtained higher—order approximations. However, it needs high computational cost to generate Pei's matrices. More recently, in  the authors present the closed form of matrix as in the limit. In this work, we find eigenvectors of the DFT matrix in a completely different way. We define the derivative operator as its bilinear discrete equivalent to discretize the Hermite-Gaussian differential equation. Since the bilinear transform maps the analog domain to the discrete domain one-to-one, we find eigenvectors which are close to the samples of the Hermite-Gaussian functions. We also analyze the stability issues. Additionally, two more methods are proposed, which employ better conditioned and higher-order bilinear matrices. The paper is organized as follows. Section 2 gives introductory information on Hermite-Gaussian functions, basics of how to generate commuting matrices and the bilinear transform. Section 3 presents the proposed methods by defining the bilinear transform-based commuting matrices including the stability analysis. Simulation results and performance analysis are given in Section 4. The paper concludes in Section 5.
where denotes the second derivative operator. Let and be square matrices. If , then and are commuting matrices. If and commute, they share at least one set of common eigenvector sets . One can further extend this idea such that, if is circulant and symmetric the above equation is also valid. is complete. We can conclude that while generating DFT commuting matrices, a good choice is to chose real, symmetric and circulant matrices and replace them with in (10). Bilinear transform is a useful and popular tool in signal and system analysis, which is often used to map the Laplace -domain to the -domain. There are numerous finite difference approximation (FDA) methods for this mapping. The most popular ones are the forward and backward difference methods and the bilinear transform. The forward difference method discretizes the derivative operator by mapping whereas the backward difference method impose . The bilinear transform maps the analog domain to the discrete domain one-to-one. It maps points in the -domain with ( axis) to the unit circle in the -plane . 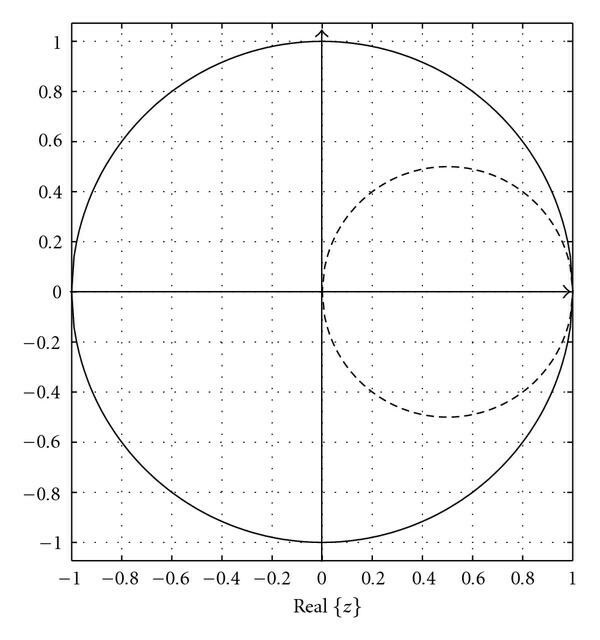 However, the forward difference method maps the to a circle of radius and centered at the point as shown in Figure 1. Bilinear transform maps every point in the -plane to the -plane without aliasing. Image of axis in the -plane for bilinear transform and the forward difference method. Solid: bilinear transform, dashed: forward difference method. with the discrete second derivative operator . An easy and accurate way of obtaining Hermite-Gaussian-like eigenvectors of the DFT matrix is to define a better commuting matrix, which imitates the Hermite-Gaussian generating differential equation given in (3) as a discrete substitute. In this section we disclose an elegant way of obtaining better commuting matrices by taking advantage of the bilinear transform, which is a good discrete substitute for the derivative operator. We omit the coefficient , since it has no effect on the eigenvectors of . commutes with the DFT matrix. As and are both circulant and symmetric, is symmetric and circulant also. We use Theorem 1 given in Section 2.2, which states that any circulant and symmetric matrix can be used to generate a commuting matrix as in (10). Since is both circulant and symmetric, the proof is complete. After generating the commuting matrix , we find its eigenvectors. The eigenvectors are Hermite-Gaussian-like eigenvectors with the number of zero-crossings equal to the order of Hermite-Gaussian eigenvectors. In Section 4 we give extensive simulations and results on these Hermite-Gaussian like eigenvectors. Adding a small value in the diagonal will not perturb the eigenvectors of the commuting matrix. As , the commuting matrix is better conditioned. The optimum value of is found to be approximately , which is given in Section 4.
where we name as th-order bilinear approximation to the second derivative, and are real scalars. The value of is chosen for , as it is an optimum value with respect to minimum total error norm which is discussed in Section 4. We have not come up with an analytical expression of 's yet, however, genetic and/or pattern search algorithms may be used to optimize the coefficients. We have used the genetic  and the pattern search  algorithms and determined optimum coefficients, , which are given in Table 1. These coefficients are inserted in (23) to obtain . We have generated the commuting matrix by substituting with in (17). When is employed, eigenvectors of  are found to be very close to the samples of Hermite-Gaussian functions as the performance is discussed in detail in the very next section. Optimum coefficients generated for . So far, three different methods are proposed, which are summarized in Algorithm 1. The first method computes , in which a small is added in the diagonal of  to achieve stability. In the second method we alter the diagonal of , with a value . Changing the diagonal both improves the performance and ensures stability. In the last proposed method we find higher-order matrices, using the and its weighted powers with for a better definition of the commuting matrix. Afterwards, we replace the computed , , or with in (17). The obtained matrix is the DFT-commuting matrix whose eigenvectors are the Hermite-Gaussian-like orthonormal vectors. Algorithm 1: Summary of the proposed algorithms. ( ) Compute one of , , or matrices. and compute the DFT-commuting matrix . We have proposed three different techniques for finding Hermite-Gaussian-like eigenvectors of the DFT. In the first method we employ defined in (21). As a second method we use as defined in (22) for different values of . Finally, we employ given in (23). 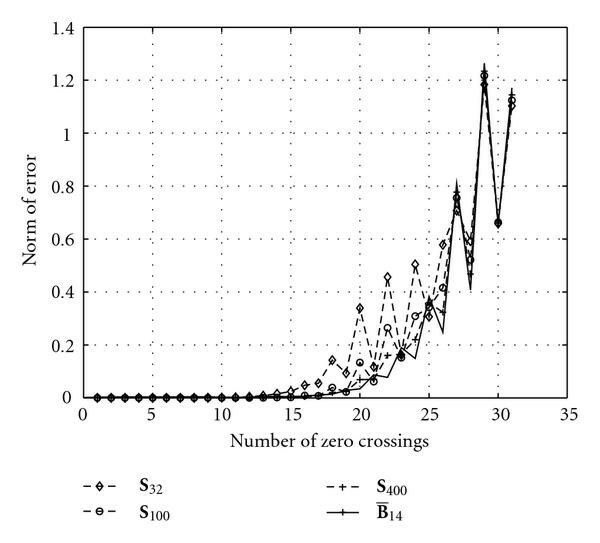 We replace each matrices in (17) as a substitute to to generate commuting matrices . Afterwards, we find eigenvectors of these commuting matrices and find the norm of error between samples of corresponding Hermite-Gaussian functions and the eigenvectors. First we compare total norms of errors between the Hermite-Gaussian functions and the samples of Hermite-Gaussian-like eigenvectors to determine optimum for . We define the total norm of error as sum of norms of error for each eigenvector. Figure 2(a) shows the total norm of error versus for different values of , and the best value for is approximately . (a) The total norm of error versus k in for N = 32, 40, 48, 56, and k = 4.3. The total norm of error is minimum when k ≈ 4.3. (b) Error norms between the discrete Hermite-Gaussian like eigenvectors and the samples of the Hermite-Gaussian functions when for k = 3, 4, and k = 4.3 and with N = 32. Comparison of errors between for , , and and with the dimensional is given in Figure 2(b). The error norm is measured as the norm of error between the samples of Hermite-Gaussian functions and Hermite-Gaussian like eigenvectors of using these matrices. As it is clear from the figures, the best overall performance is obtained in the method when . Figure 3(a) plots the norms of errors for different methods defined in . We compare the error norms of , , and in between, which are of , , and Taylor approximations, respectively, as shown in , with the method, for . Figure 3(b) plots the same comparison for . These plots show that our proposed algorithm is slightly worse than some other methods for small orders, but much better for higher-orders of eigenvectors. As it is clear from the figures, our method outperforms the other methods in total. Error norms between the discrete Hermite-Gaussian like eigenvectors and the samples of the Hermite-Gaussian functions of method when k = 4.3 are compared with various other methods for (a) N = 32 and (b) N = 64. We compare the proposed higher-order method with the other higher-order methods, , , and that employ higher-order Taylor approximations to the second derivative as shown in . Figure 4 presents the performance of the proposed method together with the other methods. Despite the fact that our method uses only the 14th order approximation, it is definitely better than these methods, even better than . Comparison of error norms between the discrete Hermite-Gaussian like eigenvectors and the samples of the Hermite-Gaussian functions of  and S32, S100, and S400 methods for N = 32. As the eigenvectors that are closer to the samples of continuous Hermite-Gaussian functions are important for a better definition of DFrFT, we employ bilinear transform-based methods to define better commuting matrices. We have proposed three different methods and analyzed their stability issues. A stable method is proposed by inserting a small in the diagonal of the bilinear matrix. Better—conditioned bilinear differentiation matrices that have better performance are also obtained. Besides, a method of generating higher-order bilinear differentiating matrices is also suggested. Simulation results show that the proposed methods posess better eigenvectors when compared to the other methods recently suggested. Future works on this subject may include finding a closed form expression for the coefficients generating the higher-order bilinear matrices, . Furthermore, matrices may be used in linear combinations with other commuting matrices, such as .